Meet Caroline Vazzana! She turned her passion for art, style, and fashion into a brand, blog, career, and now, a book. 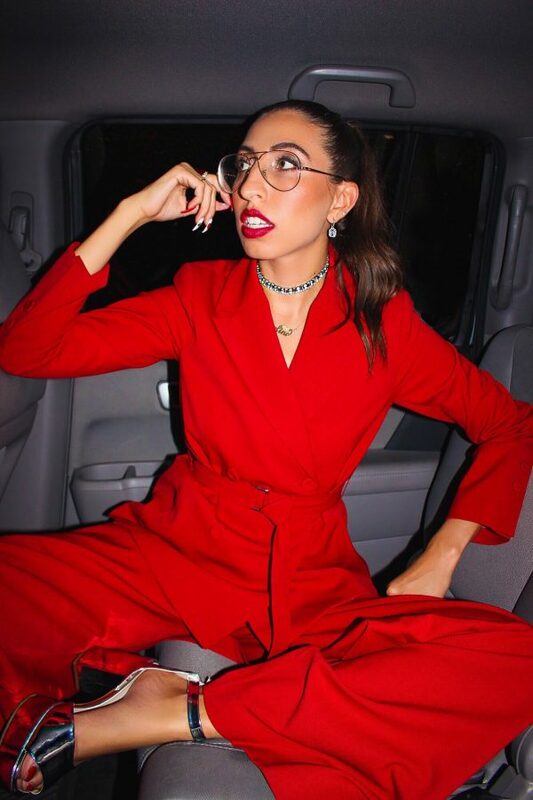 A young millenial, Caroline wants to share her experience to help others turn their interests in fashion into a career- even if you don’t live in the fashion capital of the world. We talk about her new book and blog, Making It in Manhattan, glitter, and life advice. Hi Caroline! Please introduce yourself. My name is Caroline Vazzana, I’m a fashion stylist, blogger, style influencer, and I just added author! My first book, Making it in Manhattan, was just released August 21. It’s about career advice for working in the fashion industry. How and when did you first get interested in fashion? I think when I was about 10 years old, I really loved art. I painted and drew. I thought I wanted to be an artist for a while. When Project Runway came out, everyone in America thought they wanted to be a fashioner designer, so did I! I re-focused my love of drawing into fashion and doing research into designers. My love really grew. In college, I started out as a design major and I learned that I really didn’t like sewing, so I did some internships to find out what I did like. Fashion is a very cut-throat and exclusive industry- how did you get your first opportunities in the fashion world? I didn’t know anyone when I started- it can feel very exclusive and hard to get into. I interned with Anna Sui for my first ever internship. She’s a women’s wear designer and her office is right in the heart of the Garment District. Funny enough, I just got the internship by sitting down with a textbook called Who’s Who in Fashion. It gave me a place to start. I highlighted every designer I had heard of. This was before Instagram and LinkedIn really. I Googled all the designers and contact info. I didn’t realize the email addresses on the website weren’t like, personal emails that were checked often. I sent out so, so many applications that way. 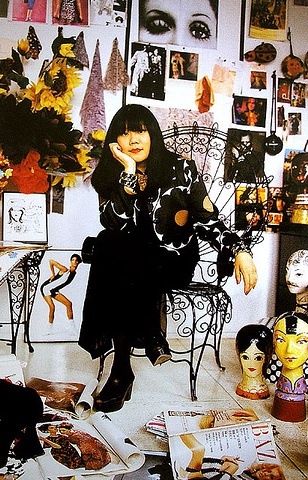 Luckily, Anna Sui had an internship email on her site. I heard back a few days later that they wanted me! It was a lot of trial and error and sending emails without hearing back. It was so nice to find one direct contact. Today, there are more resources that give out direct contact info- but I didn’t know anything then and it seemed like a good way to get my foot in the door. A lot of our readers are interested in fashion, design, and style, but don’t live in a city like NYC and/or can’t afford a prestigious design school. What advice do you have for them? That’s a great question- there’s a whole chapter about that in the book. I didn’t attend a fancy design school in NYC, I went to Albright College in PA. I write about what to do if you didn’t go to a “good fashion school.” I say my book is for a person who loves fashion but doesn’t live in a big city and wants to work in fashion. Take advantage of what’s around you, don’t focus on what you don’t have. There might be a fashion community in your town. Look at the local boutiques, vintage, or consignment shops and see what’s available. Maybe you can design windows in a local boutique. Make it the best experience you possibly can. Get involved in the programs your school does have, like fashion club. I was president of fashion club and brought in speakers and was involved in the fashion magazine. Even if your school doesn’t have that, gather the people with similar interests and start a small club. There are probably at least 5-10 people in your school that are interested in fashion, even if they don’t want to pursue a career in it. Get all the experience you can, take advantage of your resources, it looks really good on your resume when you show that you did the best with what you had. Your Insta is like, an amazing bright color explosion filled with joy and energy! How do you keep your feed fresh and how do you face the challenges of being a public persona/highly visible person? I was not always public and outgoing or good in front of the camera. Practice makes perfect. I’ve always loved fashion and fun style. Fashion should be fun and we shouldn’t take ourselves too seriously. I’m always experimenting with colors and textures. I’m always shooting and creating content of my looks, whether walking in the streets or sitting in a café. Instead of setting up a time and shooting ten looks, I try to make it very organic, just wearing my look of the day, and if I have time, I’ll snap a picture. There’s a real-life aspect to it all. It’s fun too. I try my best to be authentic and personable- it’s hard to show your personality in a picture. It’s why I’m so excited about the book- I get to speak in my voice and you get to feel my personality more. In dealing with being public, it’s an honor and I try to do my best. A lot of my followers are young girls who might look up to me for career or fashion advice or just life advice. I like to think I have a duty to be the best I can be and portray a good, healthy lifestyle. It’s so fun when I can connect with followers- I’ve been getting so many messages about the book. I’m so thankful for the things I get to do. It puts such a big smile on my face when I hear someone likes what I do! Now that your website, MakingManhattan.com is successful and you released your first book, what’s next on the horizon for you? I am excited to promote the book. I have fun events with a lot of brands like Bloomingdale’s and Chrisitian Siriano, and people, a lot of fun pop ups and book tours. I get to be a positive voice in the industry and I’m excited to tell people about it. I look forward to continuing on as a positive voice in the industry, and speaking at events, really growing the brand. The book opened me up to new people and opportunities. I’d like to write another book, as I grow in my career. This book is a beginner’s guide. I’d love to write the second book about the transition from full-time job to entrepreneurship and how my life has changed. As my readers grow, so do I. I can write a new story for all of us. I quit my day job this year to do MissHeard full time, and it’s important to be honest about what the process looks like. Yes! It’s not always easy- Instagram is a highlight reel. There’s days where I don’t have much on stories, because I am just so busy that I literally don’t have time, or I’m writing all day. It’s not always glamorous! But next week is NYFW and I get to go to so many shows and document it, which is amazing! But it is good to be open and honest. Even in this book, I talk about when I was schlepping garment bags around the city. When you’re starting out, it takes hard work and elbow grease to get ahead. My book is like the opposite of The Devil Wears Prada, which is like you can’t sit with us! Everything in my book has a positive spin on it and its inclusive- you can sit with us, and you can do it. What is the best piece of advice you’ve ever received? What nugget of wisdom would you like to share with our readers? One is life advice from my sister; I was 15 and a sophomore. I was shy, not outgoing at all. I even say now, and I think a lot of people in this industry are, kind of extroverted-introvert. One of my older sisters is so outgoing, so fearlessly herself and she doesn’t care what people think. I asked her how she did it and she just said “Carrie, what do you get out of being shy? You don’t meet new people or share new opportunities. Maybe work on your shyness.” It clicked for me and I challenged myself to break out of my shell. This totally relates to girls; just push yourself a little bit out of your comfort zone. I’ve made so many new friends and memories because I just pushed myself a little bit. I never thought of it that way, until my sister said it. The other was from a boss at Teen Vogue, she said it to a coworker who was being promoted to an editor position. My boss told her “To be a good boss, you need to learn to delegate work.” It stuck with me! Even what I do now, I have interns and an assistant. It’s important to delegate to think about what is most important for me to spend my time on. When you’re first starting out, you can do everything, but eventually you might need to add people because you can’t do it all. Otherwise you get burned out. I love to make it known: be yourself. It’s so easy to try to change yourself and your style, hair, and makeup to be (I’m using air quotes here!) “cool.” It’s important to be you. Who you are makes you different and special. Be that person who wears the pink tutu and glitter eyeshadow and stands out, it’s so much more fun to be that person. Love yourself, love your own skin, that’s what’s going to set you apart and make you special. Focus on those who do love and care about you. I built a whole brand on being the girl who loves glitter and sparkles. If I can do it, you can too! Caroline Vazzana is a fashion writer, editor, stylist, social influencer and now author living and working in New York City. Follow her: (Instagram/Twitter/ Snapchat): @cvazzana.